Christopher McQuarrie becomes the latest director to helm the Mission: Impossible franchise with the 5th installment Mission: Impossible: Rogue Nation. Usually when a franchise reaches a 5th outing it has long since run out of steam and is waiting to disappear entirely. This is definitely not the case with Mission: Impossible as it is showing no signs of slowing down or decreasing in quality. It’s impressive that after 5 films people are still eager to see more. A big driving force behind the popularity of this franchise is Tom Cruise. Love him or hate him in his personal life the guy has star power like nobody else. I’ve heard it said that he is the last of the proper movie stars, as in someone so good at what they do the mere presence of them is enough to get people in the cinema. There aren’t any other actors working today who can boast that level of magnetism. Cruise is great in this film but as far as I’m concerned he always is. The Ethan Hunt character is pretty much always the best in the room at what he does and nobody is really a match for him. He’s first to volunteer for the dangerous jobs and Cruise completely sells the confidence in getting them done. Cruise is well known for doing his own stunts and doesn’t disappoint with his obvious death wish this time out. Notable stunts include hanging off the side of a plane -featured in the trailer and poster- and a fantastically staged motorcycle chase. It’s a Tom Cruise movie so at some point he has to get on a motorcycle. We’d all be disappointed otherwise. It’s not a hard performance for Cruise as it’s a fairly similar character to many of the others he plays but he does it so effortlessly that it really doesn’t matter. We get what we expect from the brand of Tom Cruise and it’s always an absolute blast. There’s almost a secondary protagonist in relative newcomer Rebecca Ferguson’s Ilsa Faust. She is is always portrayed as being as capable as Hunt when it comes to the spy game. There’s a mutual respect between them as loyalties shift throughout the film. She’s playing a dangerous game trying to win the trust of a world class terrorist but always conducts herself with courage and skill. In many cases she gives Hunt a run for his money. Ferguson is fantastic in the role; proving that she can match wits with Cruise at every turn. They have a great antagonistic chemistry and she pulls off a great femme fatale when the occasion calls for it. I doubt we’ve seen the last of Rebecca Ferguson, wait for all the announcements connecting her to superhero roles over the coming weeks. The rest of the cast don’t quite get as much to do in comparison. Jeremy Renner and Simon Pegg return to the team from the last film but play more subdued roles. Pegg’s Benji comes along for the ride and provides IT support as well as the comic relief. It’s not overdone but never bothered me and Pegg does get some opportunity to show off his acting chops with more serious scenes to work with. Renner mostly serves as backup to Alec Baldwin’s Alan Hunley who is tasked with tracking down Hunt when he goes rogue like in every other film. Nothing bad going on here but both fall a bit by the wayside so feel almost superfluous to requirements. Ving Rhames suffers a similar fate but gets plenty of badass hacker moments to chew on. Sean Harris takes on the villain role as Lane, the leader of this rogue organisation with grand designs on a global scale. His sedate and eerie way of talking makes him instantly memorable as a villain and he seems like a match for Hunt in a different way. It’s clear that he can’t best Hunt physically but his cunning and intellect more than make up for it. There is always the impression that he has another contingency plan up his sleeve. The downside is that he doesn’t get a lot of screen time so isn’t developed quite as well as he could have been. In terms of plot the film is a bit thin on the ground and it has basically the same story as the other films when you really drill into it. I don’t have a problem with that as it is executed so well. It only really exists to get Tom Cruise to his next death defying stunt and those always do the trick. Beyond the aforementioned hanging off a plane there’s a superbly staged fight in an opera house and an underwater sequence that I would certainly call unforgettable. High octane is the best way to describe the approach this film takes to action but it manages to establish real tension when it needs to. The tone is kept light so things never become too bleak or depressing but it never feels like any of it is a joke either. It’s a really fun action experience that doesn’t need to be taken too seriously. I did feel that the film was a little on the long side. It’s a little over 2 hours all in and doesn’t drag too much but I felt a bit of lag somewhere in the second act. It’s not enough to derail the whole thing and it picks up pace as quickly as it loses it but it is somewhat noticeable. It’s a very small complaint as everything here is superbly crafted. 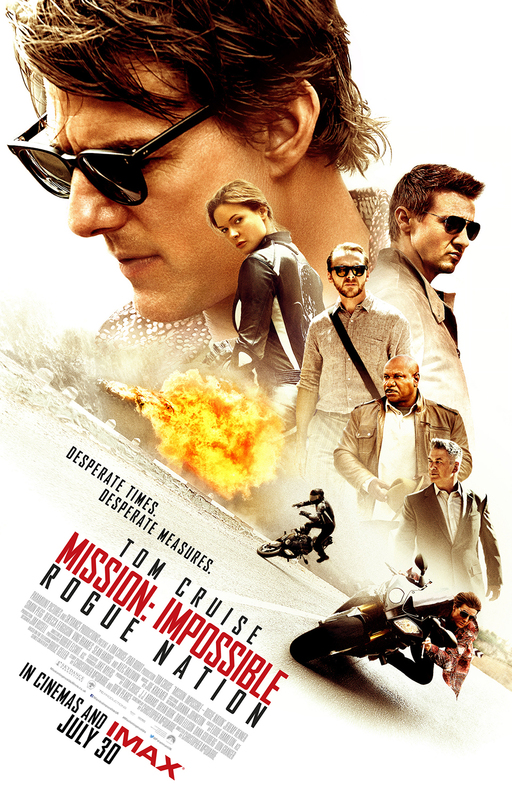 Mission: Impossible – Rogue Nation is a film I would absolutely recommend. It’s entertaining throughout, Tom Cruise is immensely watchable and has some excellent action sequences. Definitely a contender for best film of the year. An enjoyable high octane action thriller that makes excellent use of the star power of the still great Tom Cruise to entertain audiences. The popularity of this franchise pretty much relies on Tom Cruise and his predilection for insane stunts. This film has him hanging off an airplane among other things and it’s great to watch. The insanity that is Tom Cruise makes for entertaining films there is no doubt about that. Serving as a secondary protagonist is Rebecca Ferguson’s Ilsa Faust. For a relatively unknown actress she makes quite the impression here. She matches wits with Tom Cruise and comes across as more than competent in the action sequences as well as the more sedate intimidation scenes. Watch out for her as she’s going to be huge. The rest of the cast take something of a back seat but fill their roles nicely. Simon Pegg does well enough as the comic relief and gets the chance to show off his acting chops in some parts. Jeremy Renner and Alec Baldwin help prop up the background of the whole thing well. Ving Rhames suffers from a lack of screen time as well but manages to get some badass moments into the mix as well. Sean Harris does a great job as the villain. His slightly creepy way of speaking makes him memorable and he presents a formidable intellectual challenge for Cruise’s Ethan Hunt. It’s a shame he’s not in it more as he comes across as a little underdeveloped. In terms of plot the film is a little thin on ground. It only really serves to get from one set piece to the other. This isn’t a problem as the set pieces are varied and excellent. Particular highlights include an opera house fight and an underwater sequence. The tone is kept light but the stakes feel urgent enough without the whole thing becoming at all bleak or depressing. The pacing lags a little in the second act but it quickly recovers. As a result the film does feel a little on the long side but it’s a very small complaint as it is expertly crafted otherwise. I would definitely say this is a strong contender for best film of the year so far. It’s entertaining, Tom Cruise is as watchable as ever and it’s full of excellently crafted set pieces. This is definitely worth your time.